A few weeks ago I was contacted by SunRidge Farms to review some of their "better for you" sweet treats. Of course I said yes, I mean who says no to candy? I was so excited to receive my package in the mail. I think one of the best things about having a food blog is all the yummy things I get to try out! OK, back to my review. Have you ever heard of SunRidge Farms? I honestly hadn't, but I am now glad that I have. Sunridge Farms has been around since 1977 and is a family and staff run business.Their mission is to provide the healthiest products to their customers by producing foods without highly processed or refined ingredients. Sunridge Farms is also committed to being "green." The most impressive thing that they are doing for our environment in my opinion is using solar energy to make their product. How cool is that? You can read more about their green commitment here. · All Natural Dark Chocolate Coconut Chews - High-fiber, chewy coconut is covered in decadent, antioxidant-rich dark chocolate to create a mouthwatering bite-sized snack. In addition, Vanilla Coconut Chews and Mango Coconut Chews are also available. · All Natural Lemon Almonds - Dry roasted almonds are drenched in a tangy all natural lemon yogurt. A delectable snack that is both crunchy and sweet with a twist of lemon. · All Natural Mango Almonds - Dry roasted almonds immersed in a creamy mango all natural yogurt create this tantalizing taste of the tropics – a satisfying snack to nosh on this summer! · Vanilla Chai Raisins with Green Tea - All natural exotic chai spices and green tea are combined in a creamy vanilla yogurt and then smothered over plump, sun-ripened raisins. In addition, SunRidge also offers Vanilla Chai Almonds with Green Tea. My family loved them all, but our favorites were the lemon and mango almonds. The flavors were interesting and delicious. 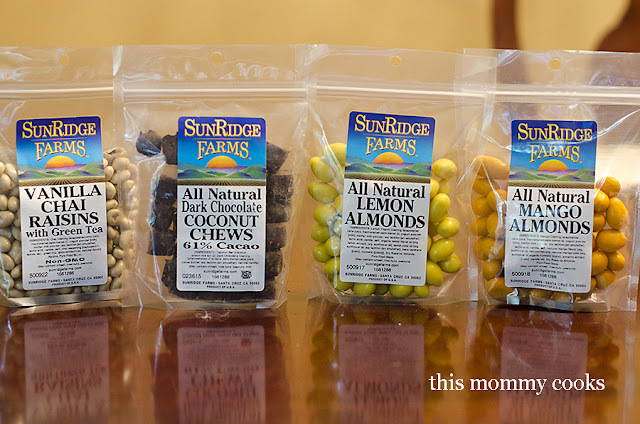 It is so great knowing that Sunridge Farms only uses "the finest, healthiest and freshest ingredients, [the snacks] are naturally flavored and colored, Non-GMO, and contain no preservatives, hydrogenated oils, or Trans fats." I mean how awesome is that! I hope you'll check out Sunridge Farms website or look for them at your local organic or natural food grocer. I was definitely missing out not knowing about this company! Disclaimer: I received free samples to complete this review. All opinions are mine and I was not compensated for this review.